The action planet Mars is currently going retrograde – or backwards – in Leo. It's starting to put on the brakes and slow to a stop, when it will then go forward. The retrograde or stuck energy will soon be over ... and things are already heating up. 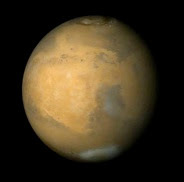 Mars retrograde only occurs about every twenty-two months. The apparent backward motion usually lasts 70 to 80 days in each period. These are the times when we really don't want to start new beginnings having to do with love or vehicles – to name a few. Why? Because aggressive energy is more comfortable moving forward. I like to wait until a retrograde planet moves past the beginning point of where the inverted motion first started, before beginning any important projects. Mars went retrograde at 19 Leo, and will back up to 0 Leo. Once it's turned around and propelling forward again from 0 Leo to 19 Leo - it will be "in it's shadow". The shadow is the ground it already went past on it's first trip to 19 Leo. The passionate planet will go forward on March 10 and get back to it's starting point at 19 Leo by May 16, 2010. Mars is so busy with oppositions to planets in Aquarius (Sun, Moon, Mercury, Venus, Jupiter, Neptune and Chiron), there is a great need to act now. It is the most challenging mission to stop the Aries planet Mars from pushing you forward. Please lay ground work and plan all you want. Clear all you want, just hold on until March 10th 9:09 AM PST. Then your actions will have much more flowing and straight action. Remember, as we get closer to Mars station direct, or moving forward, the juices in your body will be aching to come out. Hold onto your hormone horses just a bit longer. "I feel the need, the need for speed" may be riveting on your brain, but patience is a virtue. Best of luck to everyone on releasing the brakes and forging ahead in the coming weeks.